SUBHEAD: Native musicians played an oversize role in shaping American popular music. Image above: Photo portrait of Link Ray - Native American R&R hero. 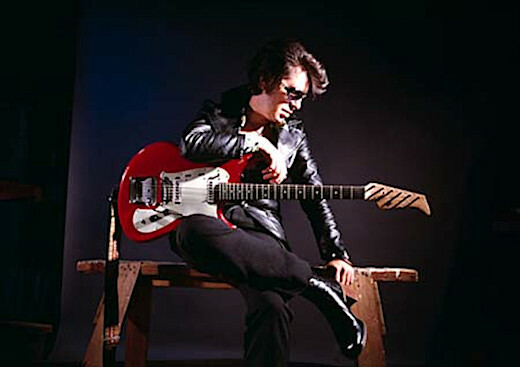 From (https://www.thegearpage.net/board/index.php?threads/eastwood-offers-up-link-wray-tribute-model.1507088/). That two minutes and twenty-five seconds of guitar nastiness inspired countless guitarists who followed and helped shift rock away from sock-hop chastity toward an edginess of danger. One of the many parts of the history of “Rumble” forgotten is that the song was banned from the airwaves for a time because it was feared this instrumental—with no words!—might incite youth violence. “Rumble” contains one of the killer riffs in all of rock ’n’ roll and essentially marks the invention of the power chord, but one of the secrets of the song’s history is that Link Wray was Native American. His ethnicity, like that of many Natives who made contributions to music, was left out of almost all his press. The documentary Rumble: The Indians That Rocked the World, which airs on PBS starting January 21, addresses the larger contribution Natives made to music. It’s an important story with many layers that involves both the human and cultural genocide that came with European conquest. The film showcases a lot of musical talent, though the legendary Wray is arguably only the fourth greatest Native guitar player—after Jesse Ed Davis (who played with Taj Mahal, Jackson Browne, and John Lennon), Robbie Robertson, and Jimi Hendrix. I’m a biographer of Hendrix, and he was proud of his Native background. Wray’s “Rumble” was one of the first songs Hendrix learned to play. He almost certainly had no idea of Wray’s background, just as most casual fans didn’t know about Hendrix’s genealogy, which included Native roots on both sides of his family tree as well as his African American ancestry (and many Hendrix fans didn’t know that his song “Cherokee Mist” was in part a homage to his grandmother). It could be argued that Robertson, a Mohawk, is one of the most important rock musicians of all time. Backing Bob Dylan with the Band when Dylan went electric, Robertson played an essential role in shifting popular music from folk to rock, but even his ethnic background was almost never talked about in the press. Cultural appropriation is the central theme of Rumble, which pairs short bios of a dozen Native musicians with commentators who explain why so much of this story has never been told. “Our peoples were part of the origin story of blues, jazz, and rock of American music, but we’re left out of the story consistently from the beginning,” says Native musician Joy Harjo. Within colonialism, and within the slave trade, music was seen as a threat, which is why plantation owners banned slaves from owning drums, a prohibition that often was also applied to Natives, as well. Rumble does an excellent job of explaining how the histories of African slaves and Natives were intertwined, as slave traders bred male slaves with female Natives from tribes they conquered. This is one of the most horrific chapters in the history of the United States (and part of the reason Hendrix had Native blood, as do many African Americans). The film asserts that the Wounded Knee massacre of 1890 began with the killing of Ghost Dancers. “It was cultural genocide,” observed the now-deceased Native activist and musician John Trudell. The career of Buffy Sainte-Marie, born on the Piapot Plains Cree First Nation Reserve in Canada, shows how both Natives and women struggled to be respected as musical artists. Sainte-Marie tells how she succeeded when she started off with folk music, but as soon as her songs became overtly political, and anti-Vietnam War, she was banned from radio. Even White male superstars like Johnny Cash found that they lost their platform when they spoke or sang about the plight of Natives. Cash’s 1964 album Bitter Tears: Ballads of the American Indian was boycotted by radio. Cash responded by taking out ads in music trade papers shaming radio (lore has it he was later adopted by the Seneca Nation to honor his activism). Cash’s now-iconic album came out long before the age of social media, which now quickly serves to draw attention to many incidents of overt racism. When headdresses became fashionable at music festivals in the last decade, a few festivals responded by banning them. Powerful deterrents have been shame hashtags and social media infamy. Musician Pharrell Williams sparked a Twitter firestorm after he wore a headdress on the cover of Elle U.K. in 2014. Rumble addresses these topics and more, and despite the importance of the story, the documentary falls short in places. While most of the commentators are Native, a number are not, and the contrast is confusing as it leaves a viewer wondering whether their tribal affiliation was mistakenly left off the title card. For example, Martin Scorsese is not who you would expect to see in this documentary. His comments lack the insight that activists like Sainte-Marie bring, but clearly he was brought in simply because he directed The Last Waltz, which is hardly a qualification on the level of the ethnomusicologists included, many of whom are Native. And when it comes to Jimi Hendrix, his adopted step-sister Janie Hendrix, quoted extensively—saying things like Native background is “part of who you are, and what you want to respect and represent”—is not blood-related to Jimi, which the film implies. There are plenty of Native Hendrixes who could have spoken instead, and this appropriation is exactly what Rumble rails against. Nonetheless, Rumble centers on an important lost part of history, a history rooted in a different, less socially aware America. The times, we hope, have changed since Wray started, though we’ll really know there has been a shift when Wray finally gets into the Rock and Roll Hall of Fame. Rumble is ultimately about the power of music to transcend. When the Native band Redbone perform their hit “Come and Get Your Love” wearing headdresses, in a song that uses Native rhythms and puts them into a context that is appropriate and not exploitative, it’s powerful. Redbone scored a top-five hit with the song, which includes a tribal beat and a classic guitar riff. Their moment onstage, in traditional dress, feels like triumph. “Come and Get Your Love” is also, like the rest of the music honored by Rumble, just plain great rock ’n’ roll. Video above: Link Ray plays "Rumble" from record album "Slinky! The Epic Sessions '58-'61". From (https://www.youtube.com/watch?v=ucTg6rZJCu4). Video above: Keith Secola & His Wild Band of Indians perform on stage live in 2008. From (https://www.secola.com/) and (https://www.youtube.com/watch?time_continue=4&v=XnZUkVf1yFA).